Nominated by Walter Hörsch, Germany, seconded by Manfred Herian, Germany. Hans Ruedi's love and knowledge of nature began when his father, a farmer in Merligen, a picturesque village bordering lake Thun, used to take him for walks in the Swiss mountains. His interest developed as he approached adulthood, but financial pressures forced Hans Ruedi into a career in banking. His first recorded acquaintance with clematis was when, on a climbing holiday in the Engadin Mountains, he chanced upon a plant with pretty blue hanging flowers. Asking a local, he was told it was the local endemic clematis, Clematis alpina. Hans Ruedi already had an interest in clematis when he met with Magnus Johnson in the mid sixties, having been told about this "Swedish Clematis Specialist" by his friend, Mrs. Dr. von Stein-Zeppelin of the Zeppelin Nursery. After some investigation Magnus and Hans Ruedi met up at the Gothenburg Botanic Gardens and there started a lifelong friendship. With his wife, Elizabeth, Hans Ruedi liked to holiday in Norway, particularly to study the local alpine plants and it was here that he first came across Clematis sibirica, growing in the wild. And even better, one with double flowers. His friend, Magnus Johnson, had told him about this plant and that it was reputed to flower double, now Hans Ruedi had seen one. Over the years Hans Ruedi's knowledge of clematis increased until he became Switzerland's clematis specialist. He gained some of this knowledge through a plant hunting expedition to the Himalayas, visiting Nepal, North India and Kashmir where he saw and collected a number of native species. All the time he was building up his clematis collection, with plants collected on various expeditions, with plants from the many contacts he made in France, Germany, Holland, the Baltic states. He said he had most success with alpinas, macropetalas, montanas, viticellas, viticella hybrids and the Baltic and Russian hybrids. 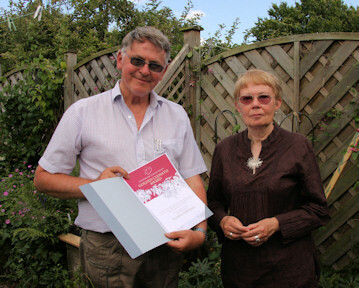 In 2001, Hans Ruedi received the Schulthess Prize, awarded to honour people who have an aptitude for the botanical, architectural, innovation and ecological in their garden, for his clematis garden in Merligen, Switzerland. The Society has visited this garden, situated on a hillside overlooking lake Thun, at least twice, and looked with amazement both at the collection of clematis and the obvious hard work it must be gardening on such a slope. Whilst I understand the planting has been reduced somewhat in recent years to make it a little more manageable, though I think it would challenge someone half the age of Hans Ruedi. Have I already mentioned, Hans Ruedi was born on April 29th 1920, so he is currently in his 88th year. And he still gardens on the side of a mountain! I give you the Clematis King of Switzerland! Nominated by Szczepan Marczyński, Poland, seconded by Jon Gooch, Great Britain. Victoria Matthews helped organize and clarify Clematis nomenclature, which had been confused and debated worldwide for many years. She compiled and edited "The International Clematis Register and Checklist 2002" and its two supplements in which she proposed Clematis classification and nomenclature in agreement with ICNCP and put together basic available information about 3000 Clematis cultivars. She was very exact and inquisitive in her work, endeavouring to reach all available references and information. She tried to resolve all doubts and worked willingly, with very many people, using diplomacy and tact to achieve acceptable conclusions. It is worth emphasizing her benevolence and kind assistance to breeders and all people wishing to receive information or explanations of Clematis nomenclature. She cooperated greatly with the International Clematis Society, frequently publishing articles, notes and information about new cultivars in "Clematis International" and advising the I.Cl.S. Council. In her activities she established the highest standards. "The International Clematis Register and Checklist 2002" by Victoria Matthews, immediately became the principle reference book on Clematis nomenclature. This is an invaluable publication, of help to all professional Clematis growers and amateur enthusiasts throughout the world. We wish to propose Victoria Matthews for the Golden Clematis Award in recognition of her professionalism, enthusiasm and dedication to provide the Clematis world with this excellent publication. Nominated by Edith Schmidt, Germany, seconded by Jürgen Knickmann, Austria. This nomination of Werner Stastny for the newly created Golden Clematis Award was spontaneous and down to conviction of his qualities. From the very early days of the I.Cl.S., Werner Stastny has worked very hard for the Society, not only as President between 1991 - 1996, but as an efficient organizer with extensive horticultural knowledge. Werner's career has been in landscaping, working with many plants, especially woody plants, as well as being concerned with living spaces and the environmental conditions of the world. Werner was one of the founders in 1989 of the Swedish Clematis Society, one of the first national Clematis Societies. It was also around this time that Werner made connections with the Baltic countries, forming relationships with breeders and growers, discovering lovely gardens and talking with their owners, thus providing a service to clematis as well as to our Society. You may say that this is what one might expect of a good president, and there is some truth in this. But you should note that in 1991 the Society had to deal with severe internal issues. Our more senior members may remember these very difficult times of crisis, with the splitting off and formation of the British Clematis Society. 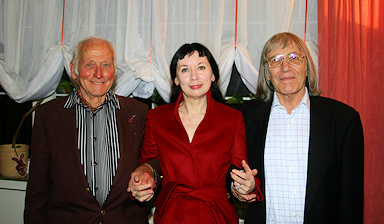 Werner Stastny and Ulf Svensson visited England for a number of long and difficult discussions to try to find a compromise and ensure the continuation of the Society. They were successful and the Society has survived and in fact flourished. It was also during this period that Werner struck up a rapport with the late John Maskelyne and largely down to their joint efforts, over time relations between the two Societies improved to the present amicable position. Werner Stastny has great focus and perseverance, as we found out in various Council Meetings. However to bring together the differing and sometimes diverging views of Clematis lovers and achieve a harmonious conclusion needs patience, perseverance and skilful tactics. So maybe we wouldn't be here now, happy to be meeting again and still in love with our darling Clematis if it were not for people such as Werner Stastny. 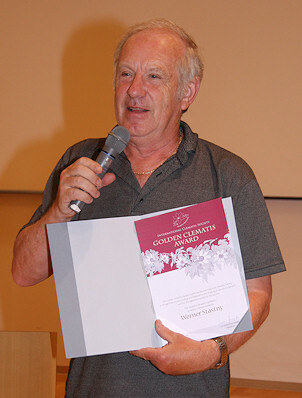 We wish to propose Werner Stastny for the Golden Clematis Award in recognition of his long years of successful work for the International Clematis Society.